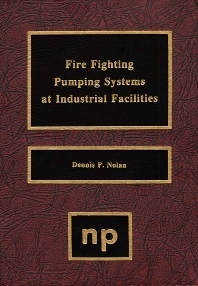 This book describes fixed firewater pump installations for industrial facilities from the viewpoint of the end users, fire protection engineers, loss prevention professionals, and those just entering a career in which decisions about fire pump installations must be made. Therefore much background information is given for the necessary requirements and usefulness of a firewater pump and the services that interface with it. This book's primary objective is the provision of practical information and basic background design principles on the application of fixed pumps for fire fighting purposes at industrial facilities, both onshore and offshore. Where specific details are necessary and pertinent to the discussion they are provided, otherwise, these can be found from the applicable fire codes and engineering practices to be applied to the facility. Experience from the installation of fire pumps in the petroleum and chemical industries, historical data, manufacturers specification sheets and regulatory code requirements have been drawn upon for the preparation of the information in this book. Fire protection engineers, loss prevention professionals, and those just entering a career in which decisions about fire pump installations must be made.